This incredibly versatile speaker is perfect for any of your audio needs. Try incorporating it into a sound system in your sunroom, patio or basement to create an entertainment space worthy of get-togethers and celebrations. 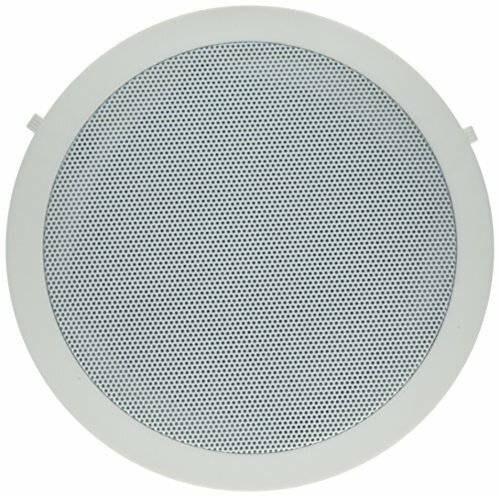 Or you can install it into walls or ceilings throughout a home or office to use as a multi-room audio application. It also make great additions to home theater systems and bring a cinema-like surround sound quality to your movie-viewing experience. It's weather-resistant, so would be ideal for outdoor applications as well. The 2-way, round speaker can handle 200 watts of power (100W RMS), and features a 5.25" woofer with polypropylene cone and 12mm soft dome tweeter. It's paintable, white grills can be hidden in a wall or ceiling because it will mount flush for nearly invisible installation. Cutout Size: 6.625" Overall Size: 7.625"